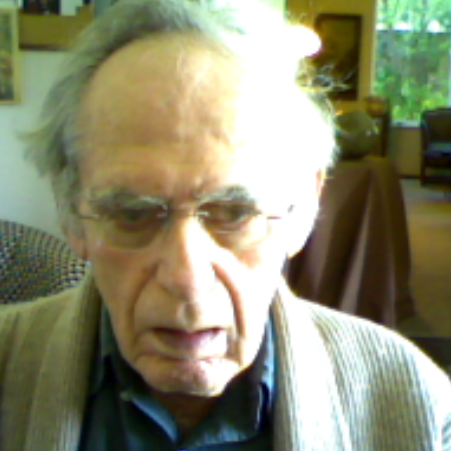 I met Bernard Feldman, Bernie to his friends, when he was in his seventies. He and my mother became late-in-life sweethearts and eventually married several years ago, after a long courtship. Bernie was very unusual in his family. His parents immigrated from Russia and his father was a window washer after they moved to the United States. Bernie was born February 17, 1921, the fourth of five children, and was the only child in his family to graduate from college. He was born in Pennsylvania, but the family moved to Chicago when Bernie was a year old and he spent his youth there. His immediate family and many of their offspring remain in the Chicago area. Bernie enlisted in the Air Force during WWII and served in England where he reached the rank of second Lieutenant. His specialty was radar. While serving in Europe he once met a French civilian on the road who asked him, "Why are you bombing us?" That experience helped spark his pacifism in later years. Bernie attended the University of Chicago, where he graduated with a bachelor's degree in electrical engineering and a master's degree in chemistry. I remember a story in which one of his professors told him not to pursue electrical engineering because "It will go nowhere." Early in his career, Bernie worked for Nathan Pritikin who later became the famous diet doctor. However at the time they were part of a team developing electrical resistors, an alternate technology that was superseded by Intel's semiconductor. Bernie and Pritikin are co-inventors on several related patents such as. Bernie also developed glass refrigeration display technology for one of his employers for many years. He sometimes reminded us that he earned a very good living working only part-time starting sometime in his fifties. At some point Bernie began to make a living off this own patents. He considered himself an engineer and inventor. Perhaps Bernie's most promising inventions are in the field of LCD displays. One patent is for a method and system for compensating for the response characteristics of a display using field sequential addressing and pre-processing. Another is a method for etching metal oxide films. I have memories of Bernie etching in his office, the garage, and in the kitchen, much to the chagrin of my mother who endured holes burned in cloth napkins, her favorite aprons, and Bernie's own clothing. Bernie also holds a provisional patent on an innovative congestion pricing structure that charges a road use fee based on time of day, etc., without special equipment on the vehicle. Although Bernie is neither a physicist nor an astronomer, he become interested in refuting the theory of Black Holes. He himself felt unable to understand the intricacies of the theories held by other scientists with the same interest. But this became somewhat of a passion. He was very excited to present his paper at Storr's this spring.